SIKO ETC5000 LCD touch control panel, 7in (177mm) diagonal display, IP65 front panel moisture protection, RS485 / SIKONETZ5 interface / protocol, standard software. SIKO DE10P-30-O-S-IP65, DE10P, 30mm hollow shaft, orange body, Stainless Steel sleeve, IP65 sealing. A key advantage is the possibility of programming all parameters of the position indicator directly at the device. This enables a basic device to be individually adapted to the particular application without need of further accessories. 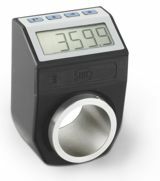 All settings such as spindle pitch, reading position, counting direction and key function can be programmed directly via the key pad.